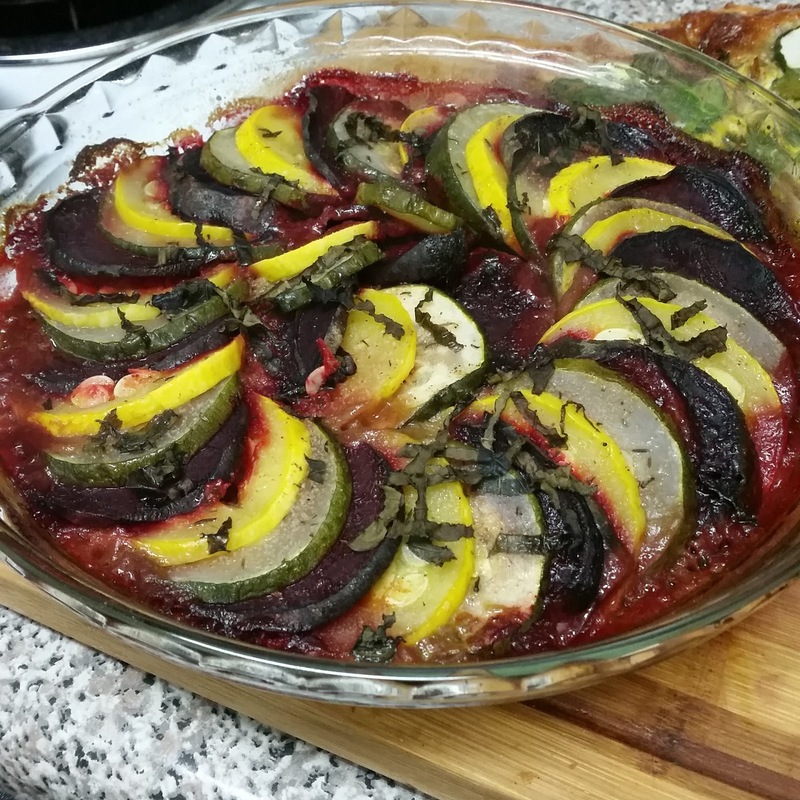 Fun fact: I always loved seeing the Disney version of the ratatouille dish. Not just because the mouse is cute (he is! ), but because it always looked so pretty and colorful. Truthfully, I've never had an authentic ratatouille. I'm extremely disappointed, but as I don't see myself reintroducing nightshades any time soon, I will have to settle for how I think it would taste. Luckily, there aren't too many crazy different ingredients, so I imagine it tastes much like a fancier version of the canned zucchini in tomatoes with Italian seasoning. I don't think we can argue with the fact that it looks much fancier too! This is a nice and savory dish perfect for colder weather. The time in the oven turns the beet-based marinara into a bold, brilliant red that adds a lovely pop of color as a side dish to grace your holiday tables too. I also shared this with some non-AIP and non-paleo friends, and most of them approved. Don't let the focus on the beets deter you. The acid of the lemon and the punch from the herbs helps to counterbalance the usual strong earthiness that the beets tend to have. In a deep skillet or small saucepan, heat the oil over medium to medium low heat. Saute the onions and mushrooms until they start to turn translucent and soften. Add garlic and saute until fragrant, about 30 seconds. Transfer the mixture to a blender or food processor, and add canned beets, remaining olive oil, lemon juice, sea salt, and dried herbs. Blend thoroughly. Taste the marinara and adjust accordingly. Sometimes more lemon is needed to balance the sweetness of the beets and sometimes more salt is need. If more herbs are needed, add oregano and basil. Pour the sauce into the bottom of a glass dish (either one 9x13 or two 8 in rounds) to fill about half an inch high. 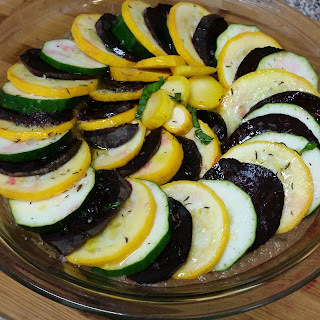 Arrange the yellow squash, zucchini and fresh beets in an alternating pattern to fill the pan. You can get as creative as you like (see example below). Drizzle the tops with a little bit of olive oil and top with a few dashes of sea salt and some chopped fresh basil. Cook on the middle rack in the oven for 35-35 min or until top is lightly brown and slices are fork-tender.